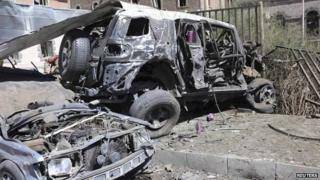 Al-Qaeda in the Arabian Peninsula (AQAP) has said it was behind an attack on Yemen's defence ministry on Thursday that left 52 people dead. The group's media arm, al-Malahim, said the ministry complex in Sanaa had been targeted because US unmanned drones were being operated from there. The attack saw a suicide bomber ram an explosives-filled car into the main gate before gunmen launched an assault. Among the dead were soldiers and civilians, including seven foreigners. It was the deadliest attack in Sanaa since May 2012, when a suicide bomber blew himself up during a rehearsal for a military parade. Thursday's attack in the Bab al-Yaman district, on the edge of Sanaa's old city, began at about 09:00 (06:00 GMT) with a huge car bomb explosion at the entrance to the defence ministry's command complex, one of the government's most important security facilities. About a dozen militants then stormed the compound, targeting civilians working at a military hospital inside or receiving treatment there. Two doctors from Germany, two others from Vietnam, as well as two nurses from the Philippines and one nurse from India were among those killed, the official Saba news agency reported. The Philippine foreign ministry said seven of its nationals had died. Other civilian victims included a top Yemeni judge and his wife, and one of President Abdrabbuh Mansour Hadi's relatives. Security forces later retook the complex after killing the attackers. Later, al-Malahim declared on Twitter that it had launched the assault "after the mujahideen proved that it accommodates rooms for controlling unmanned drones and a number of American experts". "As part of a policy to target drone control rooms, the mujahedeen have dealt a heavy blow to one," it added. "Such security headquarters in partnership with the Americans in their war on these Muslim people are a justified target wherever they may be." President Hadi has publicly praised the US drone campaign in Yemen for helping his government combat AQAP and its allies. As of October, the US military and CIA were estimated by research groups to have carried out 81 targeted killing operations in Yemen, most of them since 2009. The strikes - by drones, warplanes and cruise missiles - are thought to have killed at least 473 combatants and civilians. Yemen's Supreme Security Commission, which is chaired by the president, said the incident would "not deter the security forces, the armed forces and the honourable sons of the nation from carrying out their religious and patriotic duty in the face of terrorists". The attack came as Defence Minister Mohammed Nasser Ahmed was in Washington as part of a "strategic dialogue" to aid Yemen's political transition and to boost security co-operation. The US military upped its regional alert status after the incident and was "fully prepared to support our Yemeni partners", a senior US defence official told the Associated Press. The UN Security Council condemned "in the strongest terms" the attack and underlined the need to bring to justice the perpetrators, organisers, financiers and sponsors of such "reprehensible" acts. UN Secretary General Ban Ki-moon's special adviser for Yemen, Jamal Benomar, meanwhile stressed that "such criminal acts seeking to terrorise Yemenis will only strengthen their resolve to continue on their path of peaceful change". Yemen has been plagued by instability since its longtime president, Ali Abdullah Saleh, handed over power after a popular uprising in 2011. The country has held a National Dialogue Conference, bringing together various political groups and interests, as part of the process to draft a new constitution and pave the way for general elections next year.